If you do it without the chicken liver, this will make a wonderful "Shojin" (Buddhist-style vegetarian) dish. 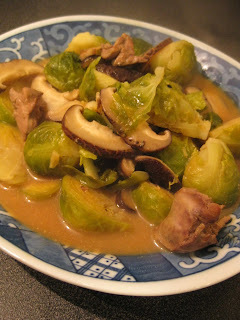 But, I somehow really like the combination of the brussels sprouts and the liver. Steam the Brussels sprouts in a steamer until they are tender (about 7-8 minutes) and set aside. Combine the ingredients for the sauce and set aside. In a pan, saute the chicken liver with the sesame oil at medium-heat for a couple of minutes. Add shiitake mushrooms and continue to saute for another couple of minutes. Add the steamed Brussels sprouts and the sauce into the pan and continue to cook for another 8-10 minutes.